but my new finds turn up often, so email me with your wants and wishs. 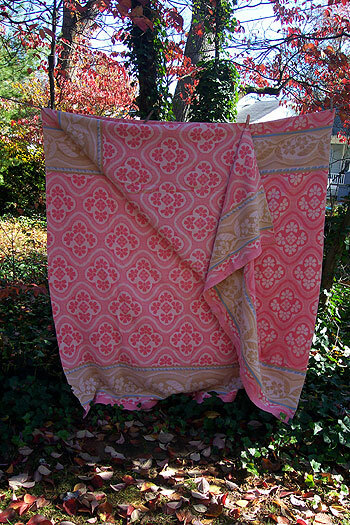 Vintage Flying duck and marsh grasses camp blanket. 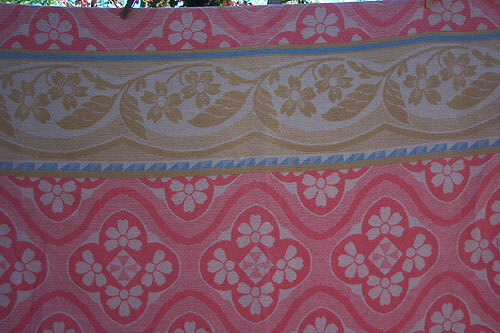 Medium weight wool, full size, 68" x 80"
slight fading along fold lines very good vintage condition. This wonderful vintage blanket is double length 7” wide by 152” long, so you can feel it’s soft warmth on both sides like a sleeping bag . 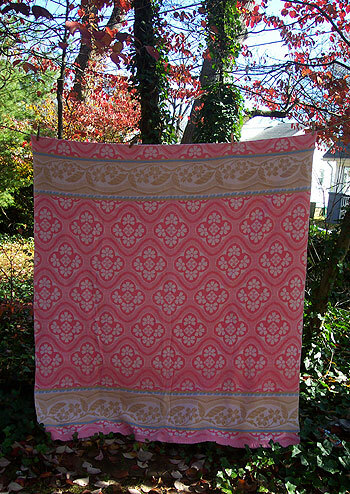 Very pretty stylized floral pattern in pink, oatmeal, golden yellow with accents of blue. Satin binding on each end. Typical weave with cotton. Excellent condition--no flaws I can find. Will keep you warm and cozy this winter. My refund policy is simple. If you're not happy, mail it back and I'll refund selling price.